Sotheby’s Auction Contemporary Art / Turkish offered 90 lots and totalled £1,266,500 (excluding premium) with a pre-sale estimate of £1,655,000 – £2,350,000. This was 33% lower than last year’s sale at Sotheby’s. 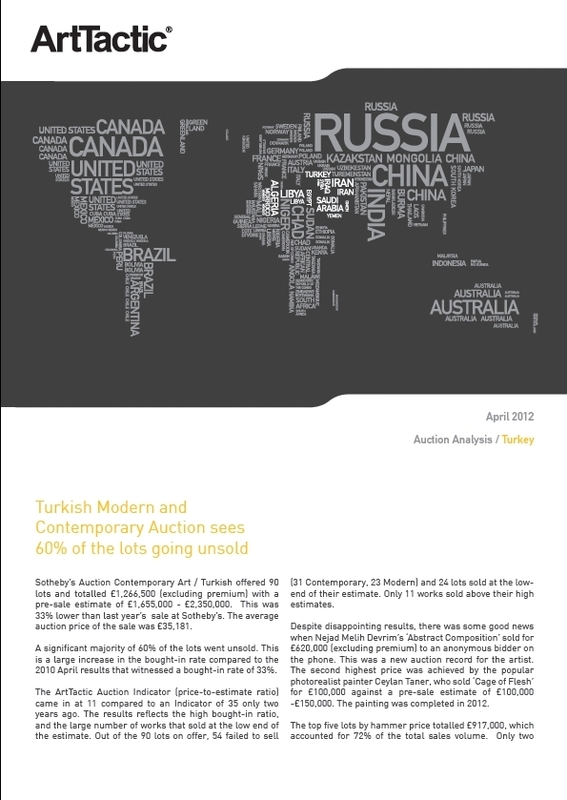 The average auction price of the sale was £35,181. A significant majority of 60% of the lots went unsold. This is a large increase in the bought-in rate compared to previous years. The ArtTactic Auction Indicator (price-to-estimate ratio) came in at 11 compared to an Indicator of 35 only two years ago. The results reflects the high bought-in ratio, and the large number of works that sold at the low end of the estimate. Out of the 90 lots on offer, 54 failed to sell (31 Contemporary, 23 Modern) and 24 lots sold at the low-end of their estimate. Only 11 works sold above their high estimates. ArtTactic has a range of memberships which give access to our art market reports, including auction analysis, art market confidence reports, art market outlook, regional art market analysis and artist reports.